This is an "S" model year, and you'd think that there wouldn't be big changes. On the outside, other than the size of the iPhone XS Max, that looks to be true -- there aren't a lot of big design changes. We've still got a notch and how much of a problem that is, is an exercise for the reader, and there's still an edge-to-edge OLED screen. The most obvious upgrade to the iPhone XS Max is the new, beautiful 6.5-inch display. Colors are vibrant, videos look great even if they do either get cropped in or show black bars, and touch sensitivity is as good as ever. We got improved speakers this year, notably with a better represented 3D soundstage. When we played back music and movies, there were times we noticed a difference, and others we didn't. The biggest change to audio is probably to the quality of the speaker audio coming out of the grill positioned in the True Depth Camera. This better speaker audio comes with the ability to finally record stereo audio in videos, which is the bigger deal for us. We're getting to the same point in mobile devices that we've been on the computer side of the market for several years now. Just about anything relatively modern will accomplish nearly everything any given user wants to do. Specs aren't everything -- but are worth mentioning. Apple is generally tight-lipped about the numbers in most of its advertising and roll-out events. But, this doesn't mean that they obscure them after the fact, or they can't be measured. The iPhone XS Max has a HDR 6.5-inch Super Retina HD display at 2688 by 1242, at 458 pixels per inch. The display is also HDR, spans the DCI-P3 color range, has a 624 cd/m2 max brightness, and a 1,000,000 to 1 typical contrast ratio. The A12 Bionic is new, and it is paired with not just the flash storage in 64GB, 256GB, or 512GB, but also 4GB of LPDDR4 RAM -- a new high on the iPhone. The TrueDepth camera system, responsible for not just selfies but also for Face ID is a 7MP shooter, with f2.2 aperture. Our review unit is a 256GB iPhone XS Max in gold. How the iPhone XS Max feels in our hands is far and away the question we get asked the most. There have been jokes made about how massive the iPhone XS Max actually is. Here's the thing, though -- it's actually a hair smaller than the iPhone Plus models, but a bit more dense. Sure, anyone with a smaller hand might struggle carrying this thing about, but no more so than they might have with the Plus line of phones introduced with the iPhone 6 Plus. The weight of the iPhone XS Max is largely due to the stainless steel frame rather than the aluminum. The glossy stainless sides and glass facing sides have a somewhat slippery finish, so the weight can either give you a little extra feedback to help you hang on to it, or be a problem making it drop from a hand more often, user depending. Throwing a case on can also alleviate the slipperiness, but if you have a tendency to "go naked" and eschew protection, it could possibly be an issue. Fortunately, the iPhone XS Max and iPhone XS have feature parity, including screen quality. There is no obvious feature you get by going with the 6.5-inch iPhone XS Max over the 5.8-inch iPhone XS other than screen area. The only exception to this is Apple claiming a slightly increased battery life which we aren't really seeing in actual use, but with the ubiquity of wireless chargers and MFi battery cases, this isn't much of an issue. We spend an inordinate amount of time snapping pics with our iPhone. That's why an increase in quality -- any increase in quality -- grabs our attention. If you need just a few words about the camera in the iPhone XS Max it is this -- it is better than the X, but not necessarily enough to warrant a whole upgrade on its own. What is new this year, is the pixel size. On the wide-angle camera, the larger sensor is equipped with a 1.4-micrometer pixel pitch, increased from 1.22-micrometer on the year ago sensor. By increasing pixel depth by nearly 20-percent, it allows the pixel to capture more light, helping with low-light photography. Apple has also coupled the updated eight-core Neural Engine with the A12 Bionic to help master photography. Apple says that this helps with things like facial recognition, facial landmarks, and image segmentation during Portrait Mode photos. We immediately noticed quicker shutter speeds, and no lag when we went to take photos. When we shot in Portrait Mode, it was able to enable the Portrait effect quicker and identify the subject in less time that on our X. We took to the outdoors to get some sample photos and were pretty impressed. The photos look outstanding on their own, but when we compare certain ones to the X, there is both more and less difference. When we max out the digital zoom to 10X, we notice that the iPhone X actually has a bit more detail. The Neural Engine smoothing effects in the iPhone XS appear to be a bit more aggressive in an attempt to make a more pleasing picture. When you are in fact shooting something that is supposed to be a bit more sharp -- like these cliffs or a building -- you don't necessarily want so much smoothing going on. When we talked about specs, we said that these deeper pixels should help low light performance, and that appears to be exactly what has happened. Low light shots do appear a bit brighter, even when not using the flash. Speaking of the flash, that too got an update. The updated True Tone flash should help photos look more natural, but we use the flash so seldom it was hard to really tell. Looking at them externally, you notice it isn't quite as pink on the two lower LEDs, but otherwise it seems quite similar. There are new colors this year, which will make some people happy, but gold can be a polarizing color. Luckily Apple has kept it subtle as they have in the past. The gold coloring isn't the stereotypical vivid yellow gold, but more of a relaxed hue. It isn't quite copper, nor is it rose gold, but somewhere in between. Apple offsets the glossy stainless steel gold band with a slightly tinted back glass that looks good, even for those of us who aren't usually fans. Wi-Fi is present as always, with a 4x4 MIMO antenna. Again this is something that the utility of will depend, based on what networking environment you have. In everyday use, we're seeing better Wi-Fi connectivity, and about 50 percent faster transfers with the better antenna system, versus the iPhone 7 and iPhone 8. The entire iPhone XS family also has support for Gigabit LTE which is of varying use in the United States depending on where you live. Additionally, the iPhone XS is the first iPhone to support T-Mobile's 600MHz "Band 71" LTE which will be of most help to urban users with skyscrapers causing wireless shadows of bad reception. Practically, the Gigabit LTE is impressive from a speed standpoint. In a Washington DC suburb, our iPhone XS Max saw just over double the download speed on AT&T's network in nearly every environment. All in all, just about every user will see a speed increase from the new modem and antenna system in the iPhone XS series. How much of a difference depends on about a thousand different variables. Bluetooth 5.0 remains unchanged from the 2017 crop of iPhones. Users coming from more than a year away will see some benefits, but not loads as Bluetooth 4.2 was pretty solid in its own right. Like Apple took heat for including a 15W charger with the 12.9-inch iPad Pro, it should take the same heat for the 5W charger with the iPhone XS Max. From a cabling perspective, Apple has still refused to ship a USB-C to Lightning cable in the box. While there is some debate at AppleInsider about this topic, I don't think that the iPhone needs to adopt USB-C. The future is wireless, so instead of inconveniencing its whole user base with an intermediary port type on the path to get to that future, Apple should stick to Lightning, but adopt USB-C on the other end. This cable is already sold separately, but no reason it shouldn't be included in the box, especially on a plus-sized phone that could use the faster charging it affords. Apple has done a great job with the iPhone XS Max. It is quite frankly, the best iPhone Apple has ever made. That statement doesn't carry much weight though, as every year Apple introduces to the world the "best iPhone" they've ever made. It is as true this year as it was last year. It still is at its core, an iPhone. If you've been fans of the iPhone in the past, you will certainly love the latest model. It has the most tech ever packed into an iPhone that, seems to be more looking towards the future rather than being perfect just today. From a usability standpoint, all the apps that took advantage of the features of the iPhone X all run here on the iPhone XS Max. They certainly load a bit quicker, but for instance, Fortnite is not necessarily any more playable here than on last year's iPhones, nor will Pages complete your task any better than it did before. The Neural Engine seems like a set-up for something. Sure, it helps take better pictures now, and we believe it also assists in parallelizing calculations across the A12 cores a bit better than previously, but it feels like untapped potential at the moment. Better Siri? Enhanced user security protections? Don't know for sure yet, but it'll be a fun ride. This is a complicated question. The iPhone XS family is a powerhouse, but so is the iPhone 8 and iPhone 8 Plus, and the iPhone X. And, frankly, the vast majority of the smartphone using population is probably fine on an older iPhone from a performance standpoint, after the release of iOS 12. Those iPhone 6 users, should they choose to upgrade, will see an amazing increase in every aspect of the iPhone, though. Users of the iPhone X will see less, obviously. Long ago, when the iPhone first launched, Steve Jobs told the world that this one device replaced many others, with a single, pocketable unit. Today, the iPhone still encompasses dozens of stand-alone devices like cameras, audio recorders, iPods, and more -- and it is rapidly becoming the device of choice for many users, with them leaving behind "trucks" like desktop computers and powerful laptops. The iPhone XS Max is an amazing device, packed with loads of technology in very much the same way the original iPhone was. It is a phone without hardware compromise, with an equally uncompromising price. Apple's iPhone XS Max is presently the ultimate expression of a single device to encompass all of your tech needs, without a briefcase full of gadgets. T-Mobile: Save up to $300 on the iPhone XS Max with an eligible trade. "We've still got a notch and how much of a problem that is, is an exercise for the reader ..."
On the X, my biggest problem is the way text wraps around the notch while reading in News and Safari. I continually scroll to watch the line I just read partially disappear because it's seems awesome. The flashlight is my only other beef: Due to the raise-to-wake feature, the screen continually lights up and I continually sleep it. If I don't, I'm distracted by the phone vibrating as it repeatedly attempts to unlock. Except for being a slab that Jobs said nobody would want. Even a 7 or 8 is bigger than I like. I'll assume the SE form factor, is dead, buried, gone for ever. But I'd snap an update version in a heartbeat. 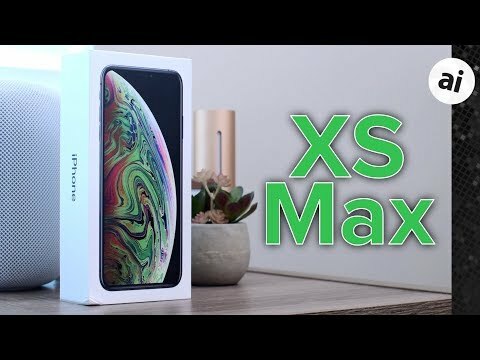 I wouldn't have to be an Xs in SE's clothing, just some more performance, and maybe an edge to edge screen. While I agree with almost everything in the review, I have one huge drawback with my new Xs Max. Battery life. I upgraded from a 6s+ which would easily go all day with my usage pattern. Now I'm lucky if the Xs Max makes it to mid afternoon before needing a recharge. Going to monitor a couple more days, and if no improvement will be taking it back to ATT. I understand what you're saying, but the wider user base proved him wrong when the iPhone 6 Plus launched. Speculation on my part, but there may be a some Machine Learning, amongst other things, going on in the background. I think that you are right to give it a few more days. Same. I've been on the beta all summer, the battery life was no problem until about a month ago. "It is the ultimate expression of Steve Jobs' original vision for the iPhone without compromise —assuming that it fits in your budget." It is definitely NOT Steve Jobs' original vision for the iPhone- he preferred something that fit in your hand. However, you are both right (above). I believe Jobs original vision of one-handed use would have evolved to incorporate phones with larger screens once he saw how much time people were spending on them, and how prevalent they would become. I remember one of announcement events when Jobs joked like this: "Today we are bringing to you iPhone with 10 inch screen." I do not remember year. He defintely understood that mobile phone is not mobile talet-like device. Whether 5.5 inch or 6.5 inch is another story, but it has to be practical in terms of transport storage, accessibility, single hand use and durability. Today people use it like there was no world around fully absorbed not paying attention to environment, replacing dedicated devices in their native use etc. Maybe that is the way to go for some, but one needs to control natural behaviors rather than drive them into some dangerous corners of humanity. I am not saing it is just screen size, but turning people's behaviors by using mobile devices with less than practical specs for small communication device. I once thought like you did. I went from the 5S to the 7 Plus. There is no way I could go back. Chips are more powerful, requiring larger battery. To support the same A12 chip, with a larger battery your beautiful SE would not be less a “slab” than the 7, 8, X or the Max. I’m hoping that Apple upgrades to Solid State batteries in the new couple years. They could make big phones lighter and provide longer time between recharging. Hopefully they do it before Samsung or any of the other Android phones. The XS & XSMax cover both sizes, which include "What Steve Jobs wanted"..
For chrissakes... give it a rest on what Steve would have wanted. The guy is gone, and Apple is running on all cylinders post-Steve. What more do you want? On the software side iOS 12 is still a battery eater on both my iPad Pro and iPhone 7 and Mojave is on my MacBook Pro as well. This seems to be a norm on newer Apple IS releases that gets fixed over time. As to the Trucks vs Cars quote of Steve Jobs, I think he was referring more to the iPad than the Jesus Phone. iOS is still not ready for any kind of decent workflow I want or need on any device and the phone- any phone- is just too small. I have to say for me, Battery life on my XS seems to be much better than my iPhone 6 it replaced. Battery Percentage on my 6 shows like 98%, but it just doesn't last as long as it used to I think. it's been 4 years. The XS is doing pretty good. Still I'm always for more battery and longer life. It's kind of annoying, the CPU shirks down and it's a little better on the battery, so instead of leaving the battery as it and getting longer life, Apple keeps on shrinking the battery right along with it. How about a little thicker and then the camera would be FLUSH!!! It wouldn't be so slippery, and there would be more space for a little larger battery? That would be a better looking phone that I think Steve Jobs would approve on more than the Camera sticking out!!! "also 4GB of LPDDR4 RAM -- a new high on the iPhone." 2017 Macbook Pro 13" has only 4GB LPDDR3 RAM. No, it has 8GB. Even the $1,099 iMac, the $999 MacBook Air and the $599 Mac mini also have 8GB RAM. The only Mac available with 4GB is the $499 mini. Except for being a slab that Jobs said nobody would want. Are you suggesting that if Jobs were still alive and running Apple that they'd still only be making iPhones with 3.5" displays? Let's be clear that Jobs was notorious for saying something as subterfuge and/or changing his mind latter. One such example is the iPod that could play videos, which I think was the next release after his infamous statement. So, if Jobs has a penchant for making such statements then why bring him up 7 years after his death as proof of anything? It is simply the best smartphone today, or even any phone, ever in history (until the next one). Do I sound like exaggerating? Maybe for some, but if you understood what is iPhone XS Max representing, even my statement is somewhat understated. Fact is, not everyone needs the best of the best, while a mediocre is sufficient for their needs. It's totally understandable.